Thursday, Jul. 10, 2008 By NATHAN THORNBURGH/NYE COUNTY, NEV.
With his belly hiding his belt, with his red suspenders and white beard, Glen Parshall is a dead ringer for Santa Claus, except for the snub-nosed pistol he keeps tucked in his back pocket. Parshall spends his days behind the gun cage of Bargain Pawn, in a roughneck North Las Vegas neighborhood littered with homeless encampments, Catholic charities and pawnshops. It's no Bellagio. But he is a gentle man who treats his customers with respect, whether hoodlum or homeowner. He knows everything there is to know about weapons and is a stickler for the byzantine rules of gun ownership--the waiting periods, the background checks, the ATF callbacks and information requests. But just because he obeys the rules doesn't mean he likes them. Parshall is dissatisfied with a lot of what government does. He hates our gun laws. Hates the war in Iraq. He doesn't use drugs, but he sees the fight against them as another government power grab. Growing up as a Mormon in Salt Lake City, Parshall was a Barry Goldwater Republican. Now he's the kind of voter who should scare the GOP most--and he's not alone. Maybe you haven't heard, but this is the year of freedom. First there was the Ron Paul revolution, in which an avuncular 10-term Representative from Brazoria County, Texas, raised more than $34 million as a pseudo-Republican candidate, garnered more than a million primary votes and outperformed Rudy Giuliani and Fred Thompson, all on the back of a get-government-off-my-back platform. Now there's the Libertarian Party, which sold a little bit of its hard-line liberty-loving soul in exchange for the most respectable candidate it has ever had: recently converted former Republican Congressman Bob Barr, who's polling nationally near 6% and could conceivably Naderize John McCain in a few key states and help nudge the presidency to Barack Obama. Since 2000, Libertarian candidates have peeled off enough votes from Republican congressional candidates to cost the party races in Washington, Nevada, Montana and, most recently, Louisiana. But if anything, the GOP platform has grown more committed to foreign military intervention and domestic moralizing. The selection of John McCain was a final insult--most libertarians view him, fairly or not, as pro-war, anti-gun, pro-environmentalism and anti--free speech (thanks to his advocacy for campaign-finance reform). In Nevada, where the liberty lobby is strong, McCain got trounced in the primary voting, coming in third behind Mitt Romney and Ron Paul. When the state GOP tried to crown McCain at its Reno convention in April, so many Paul supporters showed up that party leaders literally fled the hall, turned off the lights and postponed the convention to make sure the anemic pro-McCain camp wasn't swamped by liberty's marauders. It was like a John Ford western set inside a hotel ballroom. The central goal of Libertarianism is hard to disagree with: freedom. Defining it is another matter. Party members I've met often speak of freedom as if it were a phantom limb: you're born with it, but it gets taken from you by the bureaucratic violence of the EPA, the ATF, the DOE, the DEA, the U.N., NCLB, NAFTA and--above all--the IRS. Freedom's restoration is the magic moment when the nanny state melts away and you can see the life you were supposed to live before the tax auditors and environmental regulators and drug warriors all came to rope, brand and pen you in for life with their endless rulemaking and intrusions. If the freedom that lives in the Libertarian imagination has an earthly home, it is the American West. If it has a temple, it's Nevada. It's not just the low taxes or the libertine veneer of Las Vegas; Nevada is free, I was told, in part because so much of it is populated by an unbroken and unbowed caste of ranchers, miners and homesteaders who believe in the primacy of private property. As you might guess, things that come between a Nevadan and his land don't sit well, and over the past decade, there's been nothing more disruptive than the environmental movement's good intentions. Nye County rancher Jim Berg, 68, doesn't call himself a Libertarian, but he thinks the GOP has lost its will to keep the government from affecting his livelihood. He has plenty of war stories about his county's showdowns with the Federal Government, including a 1991 standoff when armed federales came to confiscate cattle belonging to a neighboring rancher who had let his herd graze on off-limits federal land. The Forest Service got some of Berg's cattle in the dragnet, auctioned them off and kept the proceeds. "They wanted trouble that day," he says. "Why else would you gather another man's cattle with 25 to 30 armed men?" Just across the mountain range, the tiny town of Belmont prides itself on being beyond government control. It was a mining boomtown in its heyday, filled with Cornish and Chinese and Germans and Italians. The main street of the town, now home to just seven households, winds up a steep grade past a row of crumbling stone buildings. One of the buildings had been the local whorehouse. In the basement of another building, local legend goes, two men--union organizers--were hauled out from a mine they were hiding in and lynched. All that history is falling in on itself, but Henry Berg (yup, Jim's cousin), who owns the Belmont Inn with his wife Bertie, is fine with a little neglect. What he really fears is that the electricity will get hooked up. "We don't want power, but it will come in someday, and that will be the end of it," he says. "More people will come in, and they'll want to build a Wal-Mart." There is a lot in the complaints in the Libertarian heartland that sounds like nostalgia for an idealized American past. Jim Berg will tell you about grazing-rights grievances, but he's just as quick to lament the death of the ranching lifestyle. "My grandkids have scattered like quail," he says. "They've all gone city." This sense that progress has gone too far and too fast unites a large swath of Libertarians from coast to coast. To many, modernity just means having our daily lives ruled by mechanisms that have grown so complex that they are beyond comprehension or control. It's a notion that bonds anti-WTO progressives and anti-U.N. conservatives alike--and if the party has any real hope of becoming powerful, those seemingly disparate points on the political continuum will have to get closer. 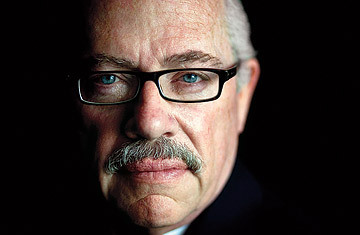 "Everybody is Libertarian about something in this country," Bob Barr told me over breakfast in midtown Manhattan recently. It's his best pitch, an oft-used explanation of why the Libertarian Party can leverage the country's many discontents. The strongest part of his message is the delivery. Barr is a level man with a rich, assuring voice. Even in a D.C.-standard-issue dark three-piece suit, there's something warm and tweedy about him--a perfectly calm spokesman for the often cantankerous ideas of his party. he often cantankerous ideas of his party. His candidacy, though, is not without risks. The Libertarian Party is looking to introduce itself as an alternative to the major parties, but it has done so by poaching politicians who, like Barr, were very recently Republicans. And Barr wasn't just any Republican. He was a premier culture warrior in Congress, leading the impeachment of Bill Clinton and fighting medical marijuana, gay marriage, even the right of soldiers to practice Wicca--all of which are anathema to the out-of-our-bedrooms libertarian ideal. In fact, one of the biggest political victories of the modern Libertarian Party was to unseat Barr in 2002; it poured money into an anti-Barr campaign, ran attack ads and called him the "worst drug warrior in Congress." Another strike against Barr: he's a former CIA official and a former federal prosecutor. "To Libertarians," one of his opponents told me, "that's like being a child molester." Barr now alternates between expressing contrition for his past and highlighting his post-9/11 record of fighting against federal rollbacks of civil liberties. He works with both the ACLU and the NRA and quotes Ayn Rand fluently. His platform these days is a soft libertarian diet of lower taxes, more privacy and school choice. Barr's moderation may keep him from tapping into Ron Paul's base, which rallied around its candidate for one of the most uncompromising campaigns in recent memory. In an interview in his congressional office, Paul told me there's a reason he had so much success, particularly with younger voters. "They're idealistic. They like consistency. They like principle," he said. For a sense of his hard-line heart, consider the fact that his signal issue was the gold standard--returning to the peg the dollar used before 1971 as a bulwark against inflation and federal mismanagement. That would mean scrapping the Federal Reserve, for starters. While Barr talks about shrinking the size of government, Paul wants to tear the entire global financial system limb from limb. Paul, who ran for President as a Libertarian in 1988, won't be telling his supporters whom to vote for. (Despite his attacks on McCain, Paul decided to stay in the Republican Party rather than mount a third-party run.) He has said, however, that they're free to go Libertarian or head for the Constitution Party. "Others," he said, "might be disgusted and go away." Hardly a ringing endorsement of the former Republicans leading his former party. How much will Paul's coolness toward Barr hurt the Libertarians? The party ticket is directed by Ross Perot's old campaign manager and is already polling a respectable 6% nationwide in the latest Zogby poll--exactly the same percentage that separates McCain and Obama. Not all of Barr's voters would be McCain voters, of course, but Barr did best with conservatives (7%) and independents (11%). In the end, that may not be enough to make a difference in 2008. But Barr's running mate, Wayne Allyn Root, says the party can ride a wave of new followers into the next election cycle. Just three years ago, after all, he wrote a book called Millionaire Republican: Why Rich Republicans Get Rich--and How You Can Too! If he can convert, he says, anyone can. I visited Root at his suburban Las Vegas home back in May. He is certainly well off, having built a sports-handicapping business that he says led him to politics. (The Founding Fathers "loved gambling," he says.) But politics isn't his only passion. Before we could begin talking about the Libertarian Party, he started selling me on his lifestyle. He takes 100 vitamin supplements every day. He and his kids never drink cow's milk, just rice milk and spring water. "I meditate, exercise, pray and do yoga every day," he says. "If I had a staff of 20, they couldn't do the work I do." All that bluster makes him seem more like a telemarketer or talk-show host than a politician, and he tells me he'd at least like to get a nationally syndicated radio show out of this presidential campaign. It would be a mistake, though, to write Root off. The things he cares about--being able to gamble legally via his home computer, continuing to homeschool his kids without much interference, keeping taxes low--speak to a lot of Americans. If the old party was cobbled together from hard-line strains of voluntarianism, propertarianism and paleolibertarianism, the new Libertarian Party is more likely to build off Root's take, which is essentially suburbanarianism. And if that happens, voters alienated by our calcified party system may find in the Libertarians a party that's a lot like Glen Parshall--armed to the teeth but with a gentle logic and a contagious enthusiasm for freedom in all its forms. Libertarians are getting ready for the mainstream, and mainstream America may finally be ready for them.